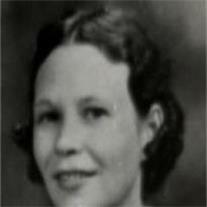 Opal Marie DeWitt, 99, passed away September 6, 2010 in Cottonwood, AZ. She was born June 19, 1911 in Plains, New Mexico and lived most of her life in Mesa and Chandler. She worked in the family business, Sunshine Laundry and Dry Cleaning. She was preceded in death by her husband William Lynn DeWitt. Those who remain to miss her are her daughters Sherrill Crouch (James G.), of Camp Verde and Kathleen Gardner (Al), of Mesa, her grandchildren Debbie Lynne Bennett (Ron), James Allen Crouch (Rebecca), Robin Gardner Juvan, Terry Wayne Crouch (Cheli), Kelli Lynn Shell (Todd), 13 great-grandchildren, and 17 great-great grandchildren. Funeral services will be Saturday, September 11, 2010 at 11 AM, preceded by a visitation at 10 AM at Bunker’s Garden Chapel, 33 N. Centennial Way in Mesa.